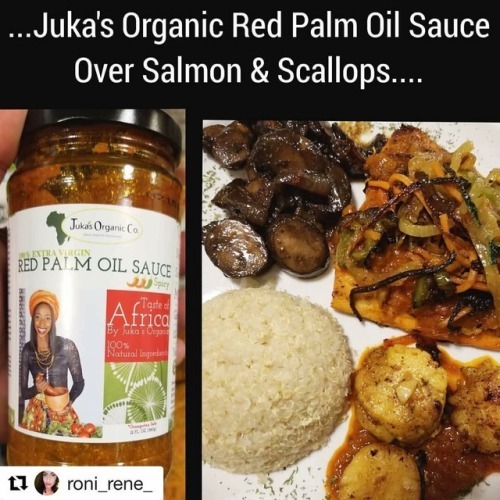 We love it when our brand “Juka’s Organic Red Palm Oil Gourmet... – Juka's Organic Co.
We love it when our brand “Juka’s Organic Red Palm Oil Gourmet Sauce” pops up on IG randomly at someone’s feed and not just on a story (although we love that too hehe) but this is epic. We are telling you this sauce is everything, especially with salmon and scallops too as we know it now. Love to see customers put their own spin on our red palm oil gourmet sauce. Looks yum, making us hungry and craving a plate now . This sauce can take your kitchen skills to another level and the good news is, you can make a whole meal in 10 mins with this sauce. Season your choice of meat “seafood or chicken” sauté it. Warm up red palm sauce in 5 mins and add your side of cook ‍ grains and Valla, you are good to dine fancy and deliciously. For more on where to buy this red palm sauce or how to use it, visit us at www.jukasorganic.com or click on bio above.